Lace Up Your Chucks with Mom! Jessie Reyez, 2018 Black High Top Chucks, 2018 Maroon High Top Chucks, Deep Blue High Top Chucks, Red Days Ahead High Top Chucks, Jessie Reyez, Graduates Wearing Chucks, Ariana Grande, SZA, Young Sheldon, Red Converse Chuck 70 Vintage Canvas High Tops, Allessia Cara, Chris Brown, Victoria Justice, Wordmark High Top Chucks, Red Stonewashed High Top Chucks, Lil Wayne, The Game, Zendaya, Vince Staples, Tyga, Kenrick Lamar, Ice Cube, Camilla Cabello, 2017 Core Red High Top Chucks, Golden State Warriors High Top Chucks, Sangria Waterproof Chuck Taylor Boots, Marvin the Martian High Top Chucks, YouTubers Wearing Chucks, Indigo High Top Chucks, Dark Atomic Teal High Top Chucks, Don’t Let Me Go (The Between), Life Now, Life Then, Snoop Dogg Wearing Chucks, Sleepy Man Banjo Band, Chucks in the Theater, Sharkskin Grey High Top Chucks, The Clash Black Leather High Top Chucks, Little Kids Wearing Chucks in Ads, Gallery 1, Little Kids Wearing Chucks in Ads, Gallery 2, Older People Wearing High-Top Chucks, Kids Wearing High-Top Chucks, Alternate Lacing Photo Guides, Buff High Top Chucks, Blue Lagoon High Top Chucks, Dusk High Top Chucks. New listings with an article: On My Block, The Temptations, Rise, Grown-ish, How I Met Your Mother, Mom, Parks and Recreation, Game of Silence, Stranger Things, Season 2, Greenhouse Academy, The Carmichael Show, Sha Na Na, Preacher, Friday Night Lights, Sun Records, Hunter Street, 13 Reasons Why, Drake & Josh, Riverdale. Other recent listings are: Cobra Kai, Young Sheldon, Fargo, Goosebumps, Puzzle Play, The Protected (Los Protegidos), Salvation, London Spy, Eyewitness, Freakish, Worst Year of My Life Again. Go to the Television Shows with Chucks Index Page. Campfire, Side Effects, Brand New, High Top Shoes, I Love LA, Say Amen, Corner Store, 2002, Old Friends, Sunflower, Hey Up There, Rise, One More Light, What Lovers Do, Mi Gente, Good Girls, Babylon, Fall, Come Over, Broken Clocks, Numb, Silver Platter, All the Kids Are Depressed, What I Miss the Most, Teen Spirit, Us, Shadows of a Rising Sun, All The Stars, Perfect Situation, Where Did You Sleep Last Night, The Writing’s On The Wall, Marry Me, Upside Down & Inside Out, Drop, How to Save a Life, Oceans, Cecilia, Jolene, Alone, Brown Eyed Girl, Bingo, Already Home, Jesus of Suburbia, Don’t Stop, Say Something, Miss Movin’ On. To All The Boys I Loved Before, Ready Player One, Robo-Dog: Airborne, Blood In, Blood Out, All Summers End, The Bachelors, Creed, The Watchman’s Canoe, Call Me By Your Name, Across the Sea of Time, Wonderstruck, It (2017), Considering Love and Other Magic, A Christmas Prince, Spider-man: Homecoming, Ghostbusters (2016), You’ll Be A Man (Tu seras un homme), Turbulence, Just Peck, Karla & Katrine, 25 Hill, Dear Eleanor, The Stream. New listings: Spud, Spud 3: Learning to Fly, Jurassic World: Fallen Kingdom, Planet Ottakring, The Tree of Life, Happy Birthday, The Family Tree, White Bird in a Blizzard, Rockaway, Summer of 84. Go to the Chuck Taylor in Films Index Page. 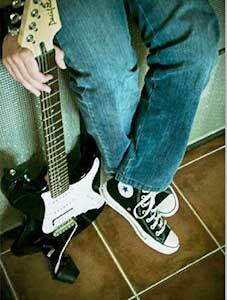 Go to the Videos and Short Films with Chucks page. 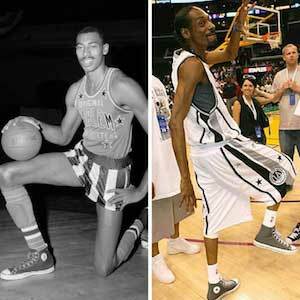 The Evolution of the Chuck Taylor article has been updated. 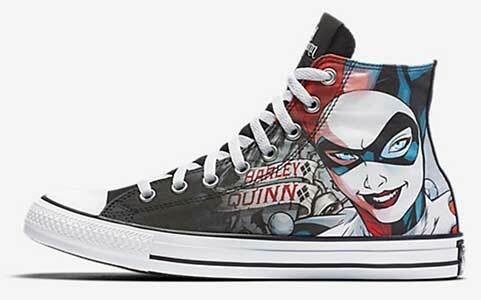 Can Converse Solve Its Chuck Challenge?, The Legend Never Dies, Chuck Taylor Sequel Flops, Halloween and Chucks. Go to the Articles about Chucks Index Page. 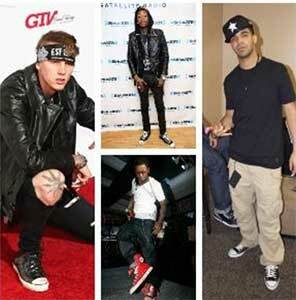 Tupac references chucks in the famous hit “California Love” saying “In L.A. we wearing chucks, not Ballys,” while the “Gucci Chuck Taylors with the dragon on the side” line will be remembered by anyone who has heard Clipse’s hit “Grindin.” Even recently there's been lines like “Still dirty Chuck Taylors, still hanging with the gangstas” on Machine Gun Kelly’s 2017 single ‘Golden God.’ Chucks have been a symbol of Machine Gun Kelly’s “EST” movement and relate to the motto, “Lace Up.” When the Cleveland rapper was asked by DJ Vlad why he still wears chucks despite having so much money now, MGK responded: “I like kids that see me and be like yo, he’s one of us.” If you go to a Machine Gun Kelly concert, you will see people ranging from all different races, and walks of life but one thing is almost uniformly similar, most of his fans will be wearing Converse, it’s a connection that everyone can make together. Tis the season for Americana. The Fourth of July is the celebrated “anniversary” of the United States’ signing of The Declaration of Independence, and is often considered America’s birthday. It’s the day of year where we as a nation fire up the BBQ pits, light some pyrotechnics, and cover ourselves in red, white, and blue garb. The first parts seem pretty straight forward, just grab some hot dogs and head to your local fireworks booth. However, the last part is more nuanced than you might think. Sure you could deck yourself out in an Uncle Sam costume and carry around Captain America’s shield, or you could look just take a peak in your closet towards your trusty chucks. The All-American shoe in red, white, and blue. Making your chucks the perfect shoe for the Fourth isn’t too hard of a task. For starters, the iconic All-Star ankle patch is always red, white, and blue which can make any pair of chucks patriotic. If you happen to own a pair of the classic white chucks, their simple red and blue accents make them the perfect shoes to celebrate America’s independence. You can even quickly spice up this classic look by switching out the default white laces with some red or blue ones. 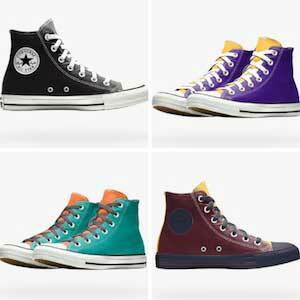 This also goes for red chucks or blue chucks, as there are tons of combinations that’ll look great. So show your pride this Fourth of July without breaking the bank on festive outfits that you’ll only wear once a year. Put together your own patriotic outfit with chucks! Father’s Day is the time of year where we all celebrate the man that has always been our rock, and our shoulder to cry on. The one who’s always offered up a pep talk when needed, and told you buck up from time to time: our dads. It’s time to show your appreciation for all the field trip chaperoning, vacation headaches, and practices made. This is dad’s day to really show how much he’s meant to you over the years, and there's no better shoe to do that in than chucks. Whether you’re a daughter or a son, you and your dad can wear a matching pair of chucks this Dad’s Day, and there are plenty of things to do while in them. Intergenerational chucks wear is very cool. Chucks are the perfect shoes for Father’s Day activities with your dad. Spend the day hiking in the great outdoors, enjoying the beauty of nature and quality time with your dad. Maybe take a fishing trip and relax as you two just catch up after a long time away from each other. Chucks are also a great shoe to enjoy a summer of sports with your dad. Maybe play an old game of catch or head out to the ballpark to check out your favorite major league team. Finally, there’s always the good old fashioned Father’s Day BBQ, where you and your dad can match chucks as you fire up the grill and serve a feast. Whatever you and dad decide to do this Father’s Day, you can’t go wrong as long as you do it together and in a pair of chucks. Happy Father’s Day to all the dads out there! 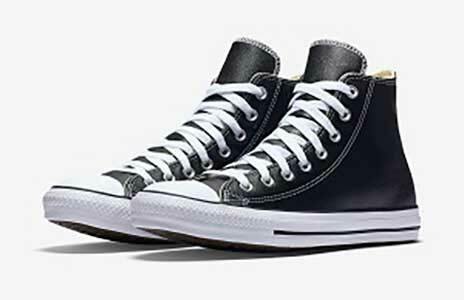 The ChucksConnection is now affiliated with ShoeCity.com for purchasing Chuck Taylor high tops, low top/oxfords, and chucks for kids. On our shoe purchasing pages you will find direct ordering links to the models of chucks available through the Shoe City website. When you use these links, your browser directly takes you to the full description and ordering page for that model, without having to go through any intermediary pages. And each time you make a shoe purchase through these links, you are helping to support the activities and databases on The ChucksConnection. Shoe City has been a long time retailer for Converse Chuck Taylor All Stars in southern California. Their stores have always been a good place to pick up a new pair of chucks. Started as a retail chain in the heart of Los Angeles thirty years ago, Shoe City now has over 35 retail stores located in Los Angeles, Orange, Riverside, and San Bernardino counties. With shoecity.com, the company now makes their many lines of shoes avalable through the Internet to customers nationwide and internationally. Processing of your order is quick, and the shoeboxes are tightly wrapped to protect them during shipping. 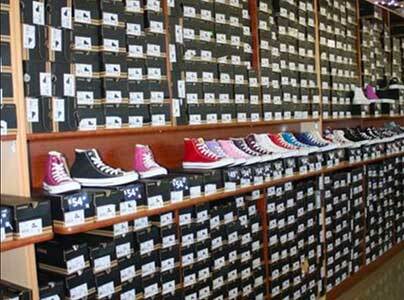 High top chucks display at the Whitter, California store. It's real easy to get started. Our ordering pages for chucks are organized into three pages, one for high tops, one for low tops/oxfords, and the third for little kid’s chucks. On that page you can find crib shoes for infants, and modified adult models in high top and low cut for toddlers, preschoolers, and elementary school kids who wear youth shoe sizes. 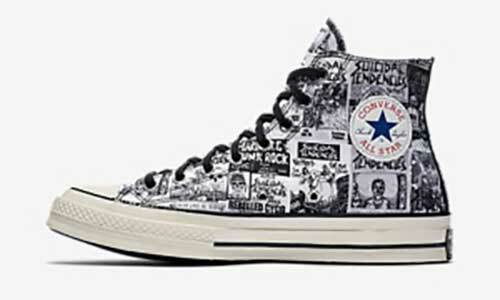 In addition to our home page links, everyone of our feature pages has a footer which includes links to these three Chuck Taylor ordering pages. With the long days of summer just ahead, it’s time to add to your rotation of chucks with a new pair! The NBA playoffs have been in full effect for just over a month now, and as of this writing we’re down to four teams vying for a shot at the championship. In the Eastern Conference, the Cleveland Cavaliers and Boston Celtics are embroiled in a heated series, that could be Lebron James’ last in a Cavaliers uniform. In the Western Conference, the two best teams in the league, the Houston Rockets and Golden State Warriors, have squared off for a trip to the Finals. 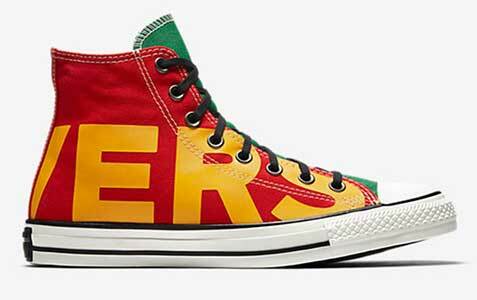 In its continued partnership with the NBA, Converse has released their Custom NBA Chuck 70’s line that offer fans the perfect way to show their fandom during the Finals, upcoming NBA Draft, and offseason. 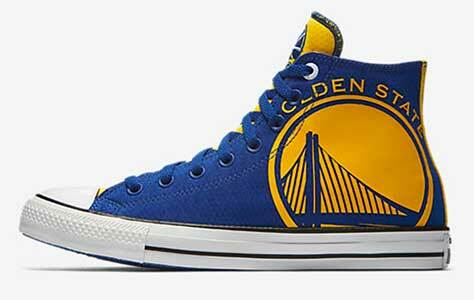 No matter who makes it to the NBA Finals this year, fans can show their team spirit with these customizable chucks. 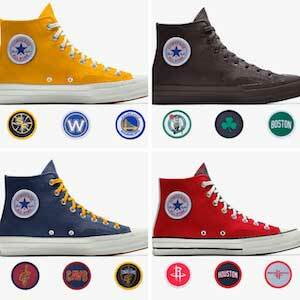 The Custom NBA Chuck 70’s line features models of ten NBA teams, including all four teams that remain in the playoffs. The highlight of this line is how it allows you to mix and match your team’s color scheme with Converse website’s customization feature. Think the Laker model doesn’t have enough purple? Add more wherever you like and create your own way to show your team pride. Each pair of chucks comes with four hook and loop patches that can be switched out whenever, allowing you to restyle your look each time you lace them up. This includes three patches that feature the team’s primary, secondary, and wordmark logos, and the traditional Converse All-Star patch. The shoe also features the NBA logo at the front end of the racing stripe on the rubber sidewall, to tie in the branding even more. 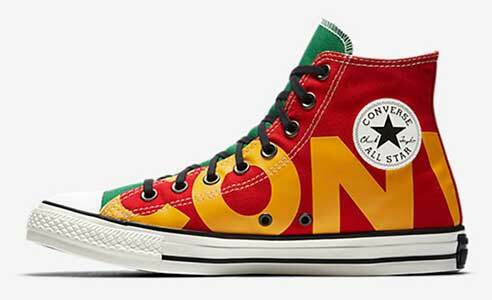 The Converse Custom NBA Chuck 70’s retail for $95, and are a pretty cool way to show off your love for your favorite NBA team as another exciting season comes to its climactic conclusion. Right about now is the time of year where millions of kids take the stage to receive the thing many have worked their whole lives for: a diploma. Whether that’s high school or college, graduation day is one of the biggest moments in a young person’s life. It marks the end of adolescence and the beginning of true adulthood. That being said, when you graduates do end up taking the stage in the coming weeks, keep in mind that the ceremony is long and that there’s a fair amount of walking involved. You’ll want to be comfortable and there’s no better shoe for this occasion that your trusty Chuck Taylors. Congratulations to all the graduates this year! On top of all that comfort, there’s also the symbolic reason to wear your chucks on graduation day. Over the years, chucks have become synonymous with youth and freedom, so it’s only appropriate that you wear chucks on your last true day of your childhood, and the last day where the freedom of youth still applies to you. Chucks also represent individuality and there’s no better way to make a statement about who you are than to wear the shoes that brought you to the dance. The shoes that stayed on your feet throughout the innocence of childhood, the drama of your teens, and the growth of young adulthood. Chucks have been with you all your life, and will stick with you when the going gets rough after the grad caps have been thrown. So show your appreciation for the real All Stars, and, if your school has a stricter dress code about what you can wear under that gown, show your Converse love with a decorated cap. Whatever you decide, congratulations to all the graduates of 2018, and go forth into the future knowing that when the road seems long and hard, you can’t count of your chucks to be with you till the end. 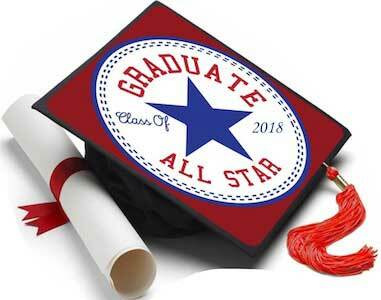 You can see a photo gallery of some graduates wearing chucks with their caps and gowns in this new photo gallery. If you are planning to wear chucks at your graduation, or if you did so in the past, send us a photo of it, and we will add it to our graduation gallery. We prefer full photos, not just the shoes, so everyone can see how cool you look wearing chucks with your cap and gown. Send your photos (and caption) to chucksphotos@chucksconnection.com. The most important holiday of the year is just around the corner, and that day is of course, Mother’s Day! Spending this day with your mother can be one of the highlights of the year, and there is no better shoe to do it in than chucks! Chucks are the perfect Mother’s Day shoe because of their ability to be worn by everybody! You and your mom will look great in your matching chucks, and some coordinated outfits may just be the extra touch to let your mom know how special she is to you. The comfort of chucks make them the perfect shoe for a some outdoor activities with mom, possibly a Mother’s Day hike. Chucks are also a great option for a Mother’s Day brunch, as sipping mimosas with mom while certainly offer some great memories. 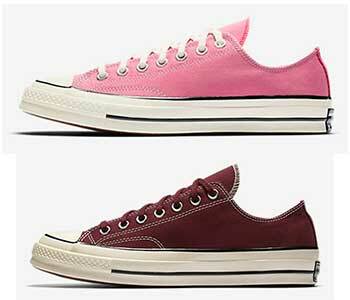 Match your chucks with your mom on Mother’s Day! The important thing is that you spend time with your mom on Mother’s Day. Take her out, show her a good time, or even just give her a phone call. In this current age of technology where you can video chat at a moment’s notice, there’s no reason to not make time for your mom on Mother’s Day. Your mom is the most important person in your life. She is the woman that births you into this world, and is the first person to show you love. Our mom’s raise us and sacrifice so much so that we can grow into good people that it’s on us to show our appreciation, not just on Mother’s Day, but everyday of our lives. Spring is traditionally the time to go through your closet and sort through your clothing to see what you want to keep and what you want to pass on to someone else. If you have a couple of pairs of chucks in there, you should take a look at them and see what you can do to make them ready to wear again if they still have life in them, usable soles, and intact features. With a little tender loving care, those chucks can be easily brought back to life. If the toe caps, front grids, and outer foxing are dirty, it is a simple matter to clean and restore them with Star Cleaner for Chucks. 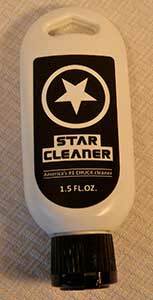 We sell Star Cleaner on this website, and this product is highly recommended for making your chucks look new again. Check out our feature about Star Cleaner in the Articles Page for more information and pictures of how it works on a well worn pair of chucks. Give your older pairs of chucks new life with Star Cleaner. A little soap and water applied from a washcloth is the best way to clean the canvas uppers. Do not put them in the washing machine, as that will wash out some of their color and weaken the tensile strength of the fabric. Another quick fix is to replace the old dirty shoelaces with a brand new pair. 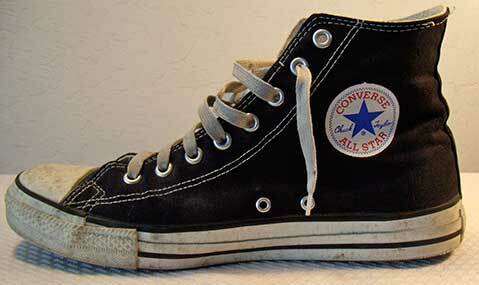 Those simple fixes are inexpensive and will provide you with a rotation of chucks to wear. One of the best ways to make your chucks last a long time is to rotate your pairs. This gives each pair more time to dry out after each day of wear which greatly increases their longevity. Spring is finally here, and after a cold and crazy winter, your first inclination may be to look at all the outdoor activities you can do. However, let’s take a moment to fully look at what else maybe going on this Spring in the great indoors. With the releases of Avengers: Infinity War, Deadpool 2, Solo: A Star Wars Story, Ocean’s 8, and Incredibles 2 all taking place before the beginning of Summer, there’s going to be plenty of opportunities to spend your days in a movie theatre this season, and no shoe is better for your moviegoing experience than chucks. The unrivaled comfort and casual style of chucks make them the perfect shoe to wear while you kick back and watch the most anticipated films of the year. 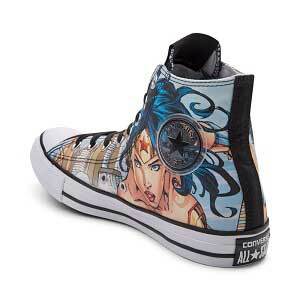 You can even show you’re true fandom by wearing branded or customized All-Stars to the cinema. The perfect shoe for seeing the cinematic event a decade in the making! However, if you’re really dead set on going outside for the first time in months, then chucks are still your best option this Spring. Whether it’s on hike through the fresh blooming flowers, or at the Spring cookout with the family, chucks are the classic and stylish option that work for every occasion. Through their past as an athletic shoe, chucks work great as the shoe of choice for pickup basketball games at the park, or even a classic Sandlot-esque game of baseball. For the Spring, bright colors are a great option when buying new chucks, and if you’re feeling really bold, maybe go with a pastel color. So whether you’re spending the season in a air conditioned theatre, or enjoying the beauty of nature outside, chucks are the go to option this Spring. Over the past decade or so, YouTube’s open platform has led to the rise of many comedy channels. In fact, comedy channels such as Smosh, Rooster Teeth, Ryan Higa, Jenna Marbles, JacksFilms, KSI and others are some of the earliest YouTube success stories, and are still ranked among the top when it comes to subscribers and views. Even though YouTube may now be primarily seen as a platform for video game content and movie trailers, it still has plenty of thriving comedy channels. Studio C is a sketch comedy TV show from Provo, Utah, that started out as the BYU sketch comedy troupe Divine Comedy, which all of the Studio C cast members are current or former members of. The show airs on BYUTV, and also uploads twice a week to their YouTube channel. Over the years, the troupe has amassed over 1.7 million subscribers and 1.3 billion views on their main channel, with over 800 videos in their catalog. 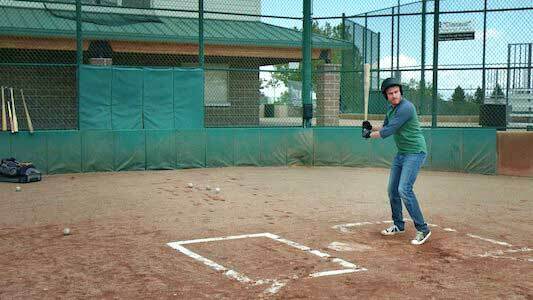 Studio C cast member Jason Gray wears black chucks in the sketch “A Royal Swing and a Miss”. Originally planned to be called Common Room, the name was changed to Studio C as a tribute to the studio in the BYU Broadcasting Building where the show is filmed in front of a live audience. The show follows a similar mold to other sketch comedy shows such as SNL, MadTV, and In Living Color, but aims to add a family friendly twist to their content. This means wholesome comedy for the whole family, and while some may think that would detract from the jokes or make them lame, it actually isn’t a hindrance at all. The jokes are so good that they don’t need to be raunchy or profane, and on a place as wild as the internet, a little bit of family-friendly content can be refreshing. Besides the comedy, the cast can be seen wearing chucks in nearly every video, which adds another layer of Americana to this wholesome act. Some good videos to check out are “A Royal Swing and A Miss”, “Werewolf”, “Top Soccer Shootout Ever With Scott Sterling”, and “The Drop”. This is definitely the type of channel where you can spend a whole day binge watching videos, so check it out when you’ve got a few hours to kill! 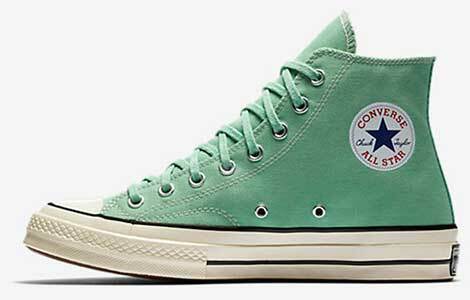 Converse has recently released a new edition to the chucks family, and it’s a bold one. The new Chuck Taylor “Wordmark” line has hit the stores and is the perfect look if you’re looking to go big this Spring. The “Wordmark” line comes in three varieties with colors differing depending on shoe model. 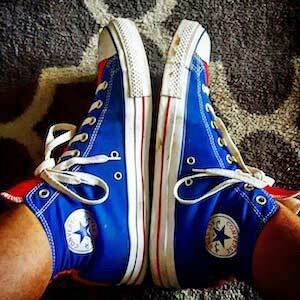 Let’s start with the classic high and low top chucks, which retail between $65-$75 and are now on sale for under $50. 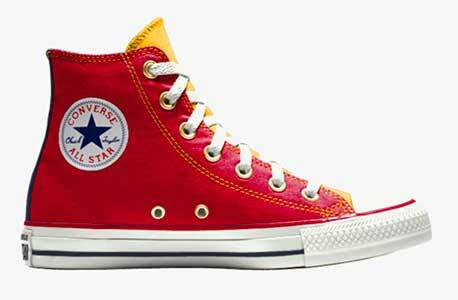 These are the classic chucks that you’ve always loved, but feature the word “CONVERSE” emblazoned around the shoe. The low top only comes in one color, a white shoe with blue lettering. However, the high top variety comes in two color schemes: a red, yellow, and green version, and a simple black and white one. This brightly colored red, yellow, and green model is particularly appealing as it offers the perfect color scheme for both the Spring and Summer seasons. 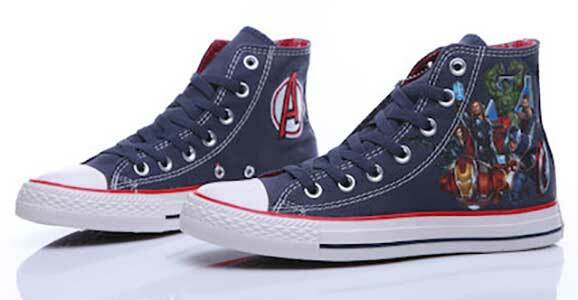 It’s also the perfect shoe for Marvel fans, as it matches the classic comic book color scheme for Vision. With Avengers: Infinity War a few weeks away from release, these shoes are an excellent choice for your premiere night wardrobe. See a complete photo gallery of this model. Right inside patch and top views of the red, green and yellow wordmark high top. Outside view of the red, green, and yellow wordmark right high top. Finally, let’s take a look at the Chuck 70 model. 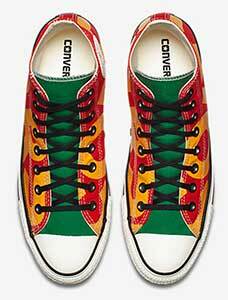 This model differs from the high and low top chucks in two ways. The first is that they’re leather rather than canvas, and the second is that rather than have the word “CONVERSE” around the shoe, it features a single large “C” on the side stitched in wool. This variety retails for $100, and comes in three different color scheme: Red, Black, and Navy. So whether you’re in the market for some interesting color choices, a big bold aesthetic, or a revamped classic, the Converse “Wordmark” line is a must get. On February 28th, 2018, Marvel Comics released the 300th issue of Peter Parker: The Spectacular Spider-Man. The issue resolves the “Most Wanted” arc which saw Spider-Man engage in a battle of wits and fists against one of his greatest foes, The Tinkerer. This comic serves as a companion series to the more famous The Amazing Spider-Man series, and explores the daily life of the wall crawler while focusing on his smaller stories and acts of heroism. This tricentennial issue proudly features a gorgeous cover that has Peter Parker changing into his iconic costume in front of a large neon sign that reads “300”. His civilian attire includes a white dress shirt, blue pants, and a maroon pair of chucks tied by the laces around his neck. 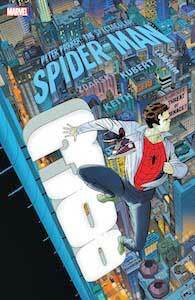 The landmark cover of Peter Parker: The Spectacular Spider-Man #300 features Peter Parker with a pair of maroon chucks around his neck as he changes into his Spider-Man uniform. The fact that Peter is dressed in his color scheme and in chucks is not a coincidence, as this is not the first time the wall crawler has been featured in chucks. The character of Peter Parker/Spider-Man has actually had a very long history with the Chuck Taylor All Star, dating back to his inception. Throughout the Andrew Garfield led Amazing Spider-Man film series, the character of Peter Parker wears chucks. The character is again seen wearing chucks in his latest solo outing, Spider-Man: Homecoming, which is Spider-Man’s first film set in the Marvel Cinematic Universe. In the comics, Peter Parker has also been drawn as a chucks wearer multiple times over the course of his nearly 60 year history. The image of Peter Parker in chucks is used so often because it’s a match made in heaven. Chucks have always been considered the shoe of the underdog, and Spider-Man is the ultimate underdog superhero. Vince Staples has had a long history with chucks. As one of the hottest up and coming hip-hop artists out there, Vince has featured and worn chucks in several of his music videos. He has also appeared in numerous video campaigns for Converse, including their mini-documentary on the relationship between chucks and the city of Los Angeles, of which Vince is a native. So, it was only fitting for Vince to team up with Converse to create his own set of merchandise for his upcoming Life Aquatic Tour, giving his fans a signature look that’s unique and fresh. 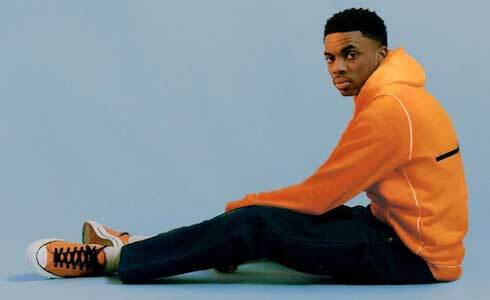 Vince Staples modeling his new collection of Converse clothing. This collection consists of two different color schemes and heights of the Chuck ’70 and two different color schemes of an original hoodie. The chucks come in two variants: a low top option in orange and high top option in black. Both variants come emblazend with Vince Staples branding all over the shoe. There’s the word “fish” printed on the tongue, the word “sea” printed on the heel stay, and “Staples” stitched in tonal embroidery on the collar. The hoodies also come in both orange and black options, and have the same “SEA” wordmark that the shoes have. The collection is heavily influenced by Vince’s latest album “Big Fish Theory”, using the album cover art for the design of the translucent sole. The overall design of the collection are wholly unique to Vince, and is very clean, simple, and fresh. This really is the ultimate merchandise for fans of Vince, and the perfect getup to wear to any of the concerts on his tour. How do you express love with a pair of chucks? Certainly red colored chucks could do this, with that color associated with Valentine’s Day. You could wear matching red pairs like you see in this month’s cartoon, accessible from our home page or the books and comics page. Adding a pair of red chucks to your rotation or giving a pair to your true love is a cool way to spread your love of chucks to someone else. There are also seasonal chucks that have heart pattern uppers sold in department stores like Kohl’s. 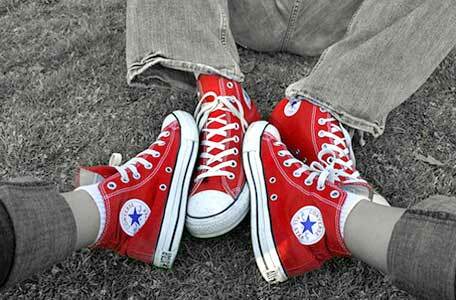 Are red chucks your true love? One of the best things about chucks is that they are a unisex shoe, so anyone can lace up a pair as a normal part of their clothing collection. Wearing a pair, especially a color like red, can brighten up your day and your outlook on life. And they do attract attention if you want someone or a special person to notice you. Certainly your feet wll love wearing them. Another reason to get a new pair at Valentine’s Day is they are a reminder that spring is on its way. That’s something we can all look forward to. Converse has just announced eight new seasonal models for 2018. The new colors are Barely Rose, Green, Hyper Magenta, Hyper Royal, Maroon, Orange, Purple, and Saddle Brown. These new issue chucks are available in high top and low top models, and come in half sizes. Maroon and Purple are returnees from 2017. There could be some confusion regarding the Green, Orange, and Purple models, as these shades are different from models in previous years, but do not have any qualifiers that would help to more accurately describe them. The green shoe is very close to an olive green, and the orange shoe is a bright orange this year. Barely Rose, Green, Hyper Magenta, Hyper Royal, Maroon, Orange, Purple, and Saddle Brown. Although the maroon and purple models retain their prices from previous years, the other models are now priced at $65 for high tops, and $60 for low top oxfords, which is actually higher than the retail price for core colors. Time will tell how well these new colors at a higher price will sell. It is also expected that additional colors will be released later in the year. The 24th Annual Screen Actors Guild Awards were held this past weekend, and the stars of TV and film were out in full force. As we all know, a major part of every award show is the red carpet ceremony, and all the fashion that is on display. So, donning gorgeous gowns and dashing suits, Hollywood’s biggest actors and actresses walked the red carpet before the awards were handed out, and attempted to make the various “Best Dressed” lists for the night. However, one young actress in particular stood out amongst all the Versace, Calvin Klein, Valentino, and Vera Wang, and she did it all in a pair of white Chuck Taylors. Millie Bobby Brown wearing low top optical white chucks on the SAG Awards red carpet. Millie Bobby Brown has long been a wearer of chucks and Converse products. She was on the first episode of Converse Public Access with Maisie Williams, she has hosted the Chucks in Film series, and she has worn chucks while playing the character Eleven on Netflix’s Stranger Things. However, Brown’s love of chucks has never been more apparent than when she wore a pair of optical white All Stars on the SAG Red Carpet, pairing these pristine, low top chucks with a glittering, baby pink gown. Her shoes were especially highlighted thanks to her gown stopping just above the knee, which allowed the chucks to really shine. However, the ensemble wasn’t too casual, as her dress has a flowing train attached to it that elevated her whole look. Basically, it was the perfect blend of the casual and formal worlds of style, while staying true to who she is. 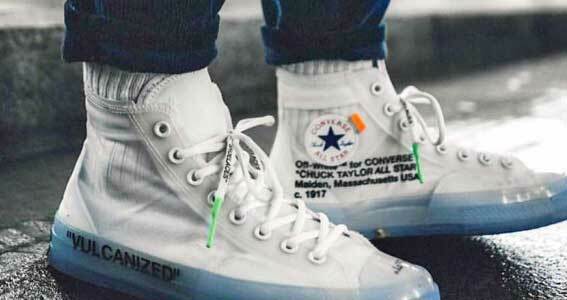 As we look ahead to the year 2018, you can be sure that The ChucksConnection will continue to report on new Converse releases throughout the year, other developments affecting the brand and their Chuck Taylor line of sneakers, and interesting features about people who like to wear chucks. 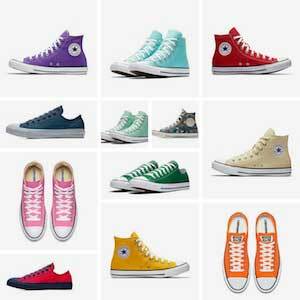 You can also look forward to reports and reviews about new films and television series with chucks in them, along with music video reviews and information about musicians and entertainers who like to wear chucks. We continue to make available for your information, research, and enjoyment hundreds of articles, features, books, photo galleries, and comics about chucks and the chucks lifestyle. And we remain your best source for shoelaces and cleaner for your chucks. Rock out in your chucks this year. Happy New Year! Stay laced and active in your chucks all during 2018. Every year the NFL does something special called My Cause, My Cleats. During Week 13 of the regular season, NFL players are allowed to break the usually strict uniform rules by playing in custom colored cleats. These cleats showcase different charities and causes that are important to each individual player. Some of these designs highlight causes and charities like the Make-A-Wish Foundation, Boys & Girls Club of America, American Cancer Society, Alzheimer’s, Breast Cancer Awareness, and even their own personal charities. My Cause, My Cleats is a great way to raise awareness and allow NFL player to express themselves. 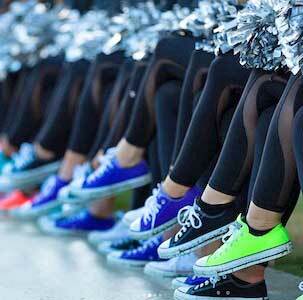 The Oakland Raiders cheerleaders show off their colored chucks that represent a specific cause. This year the Oakland Raiders cheerleaders (a.k.a. The Raiderettes) wanted to join in the cause. However, since cheerleaders don’t actually wear cleats, they decided to highlight specific charities by wearing colored chucks instead. They did this during their warm up routine before the team's game against the New York Giants. These colors and causes include blue chucks for Boys & Girls Club of America, purple for Alzheimer’s disease/Domestic Violence, red for HIV/AIDS, white for bone disease, black for fallen loved ones/ POW-MIA, and pink for Breast Cancer awareness. The Raiderettes also took to their Instagram page to highlight these chucks. 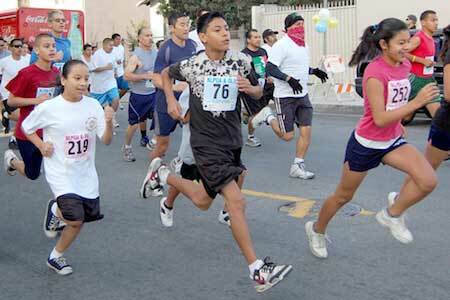 It’s good to see that this yearly event is spreading to more than just the cleats on players feet. It’s important to highlight and champion whatever charity is important to you, and it’s heartwarming to see so many using their enormous platform to show off so many worthy causes. The Fall season is in full swing, which means that rain, sleet, and snow are right around the corner. With that in mind, Converse has released a new line of winter wear that includes new outerwear jackets, and a new line of waterproof Chuck Taylor boots. Converse says that they are “like a regular sneaker but water repellent”, promising a stylish yet protective shoe to keep you feet dry. To ensure that, they’ve made this line of waterproof boots out of Nubuck leather. What is Nubuck leather? Nubuck is top-grain cattle leather that is very resistant to wear, and is similar to suede. It is has more strength and thickness and a finer grain than sueda though, and is generally more expensive. Nubuck is soft to the touch, and does not stain from water, making them the perfect combination of comfort and protection. Besides the nubuck uppers, the shoes feature an inner layer of extra protection, a bootie around your ankles. They are treated with a counter climate process that keeps water out. They have extra thick outer soles to help prevent slipping when walking in the rain. The insole is Lunarlon. They have built in hooks on the back spines so you can hang them to dry out if they get really wet on the outside. Their color design is monochrome on the sangria and the black models, and like the Chuck Taylor II for the gray and brown models. The matching shoelaces are narrow round. Both the ankle patch and the ankle patch are embossed and blended into the shoes. A sangria Chuck Taylor waterproof boot. Click here to see a complete photo gallery. Converse has released these Nubuck boots in four distinct colors: Black, Sangria, Grey, and Brown. However, the latter two are styled in the same way as the Chuck Taylor II’s, so, unless you’re someone who enjoys that style, you may want to avoid gray and brown. We recommend going with the Black and Sangria monochrome models instead, as they are stylish, and go with most any ensemble you can put together. 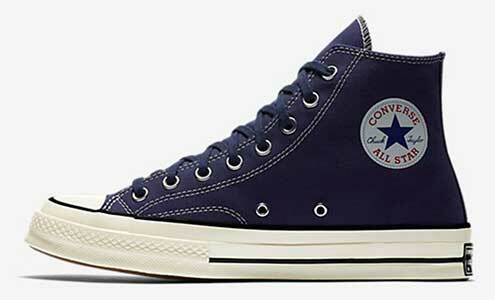 The Converse Chuck Taylor All-Star Waterproof Nubuck boots cost $120 on Converse.com, which is comparable to most casual, waterproof boots. 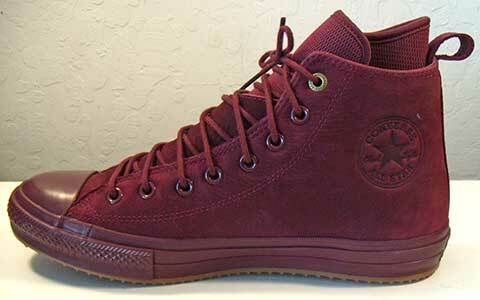 However, no competitor can match the style and comfort that Converse provides with these new Chuck Taylor boots. For Fall, 2017, Converse has released a new NBA Collection of team basketball shoes. 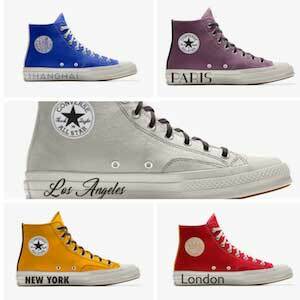 The collection has three lines, the Chuck ’70 NBA Gameday, Chuck ’70 NBA Legend, and the Chuck SE NBA Franchise. The Gameday series is a limited edition of only 250 pairs per team, one for each of the thirty NBA teams. The uppers are made out of real NBA jerseys, which means each shoe may look a little different depending on size and the cut of the jersey. The inside has a nice, comfortable sockliner and Converse says that the Chuck ’70 is built to the specs that used to dominate the NBA. They don't have the actual look of vintage chucks , due to the lack of racing stripes, and their all white foxing and outer soles. The other bad news is that each pair is $250, and many of the editions have already sold out. Outside view of a Golden State Warrior Chuck SE NBA Franchise high top. Click here to see a photo gallery of this model. The Chuck ’70 NBA Legend models are dedicated to just five teams, the Boston Celtics (black and white), the Golden State Warriors (blue and white), the Chicago Bulls (black and red), The New York Knicks (monochrome black), and the Los Angeles Lakes (white and blue trim). They have leather uppers but no racing stripes on their monochrome black or all white outer foxing. These shoes price at $150. 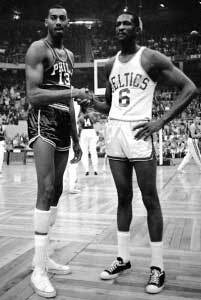 For chucks enthusiasts who want their chucks closer to their original design, there are Chuck SE NBA Franchise models which price at $90. There are currently twelve different team models available. They have print uppers and ankles patches that coordinate with their team colors. They do have the traditional toe caps and racing stripes. Consumer demand seems to be great for these basketball shoes, so if you are interested in a pair, act fast. Converse has recently launched a new digital show called “Converse Public Access”. The show is a parody of the sometimes wacky and hilarious realm of local public access television. The show also aims to “present the voice and visions of today’s youth”. Each week, a new host comes on and does the show their own special way. The first episode featured Game of Thrones actress Maisie Williams, and a slew of guests playing games, talking about their lives, and parodying the random awkwardness of local public access TV. The second episode dials back on the games and randomness, and features Miley Cyrus acting as host. She has only one guest on, a young up and coming rapper named Buddy. 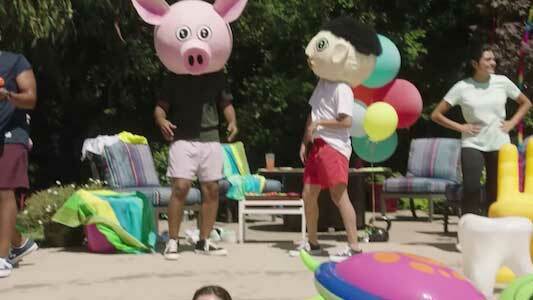 Miley Cyrus hosts this episode of Converse Public Access. Buddy is a 24-year-old rapper from Compton, California who grew up performing in musicals such as The Wiz, Dreamgirls, and Oliver With A Twist. Miley does a great job interviewing a very talented young man who is unknown by most people, and letting them get a great sense of who he is. It’s a laid back interview conducted poolside in front of a dinosaur and a cow. There are other people there with Miley and Buddy, some of which are wearing chucks. Miley is wearing a pair of silver, shiny platform chucks. This episode is much more appealing to all audiences, rather than just the irreverent loving youth like last week was. It still has a lot of charm and humor though, and Miley does a surprisingly great job interviewing. Definitely check this episode out if you have the time. There are plenty of oddities in this episode. 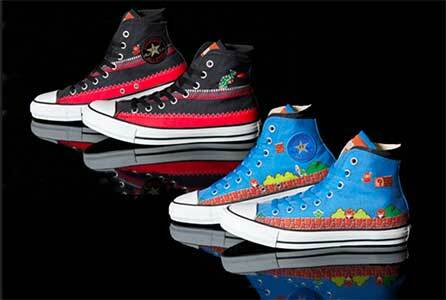 Converse has just released a new line of cartoon-themed chucks with print patterns containing Looney Tunes characters. For adults and bigger kids there are four different models, a Marvin the Martian high top, a Bugs & Daffy low top, and a Sylvester & Tweety high top. For little kids, the Marvin the Martian and Sylvester & Tweety high tops are available along with a Bugs Bunny grey high top. Marvin the Martian also comes in an infant/toddler model. 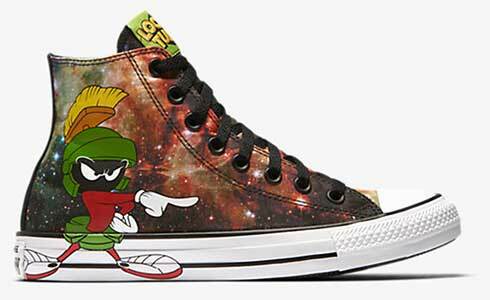 Outside view of a right Marvin the Martian high top. The Marvin the Martian high top has an orange and black space background print, with Marvin on the outsides extending onto the white foxing, and the space dog Commander K-9 on the inside patch sides. The Chuck Taylor ankle patch is a sewn on black cirle with all the word and star in green. The toe caps and outer foxing are bright white, with black racing stripes, standard black heel patches. The back spine is all black as is the thread throughout the uppers. The shoelaces are black with a green aglet. The tongues feature a Looney Tunes patch at the top. 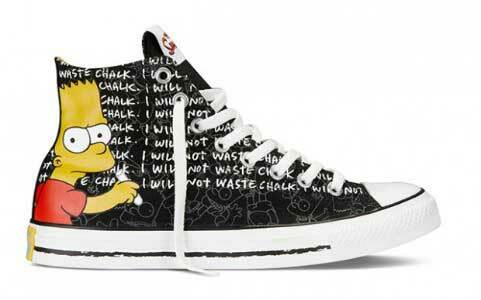 On their backs inside the tongues, it reads “That’s all folks!” The insole is green and the inner canvas is black, as are the outer soles. 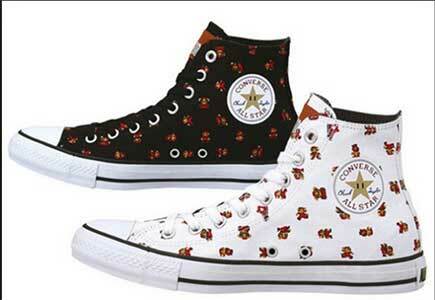 The Sylvester & Tweety high tops feature prints of the characters on all white chucks. 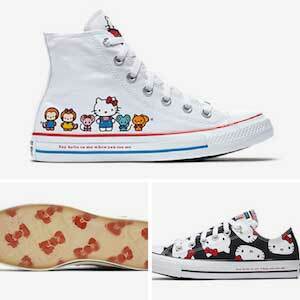 The shoes price at $65 for the adult models, $40 for the kids models, and $35 for the infant toddler shoe. 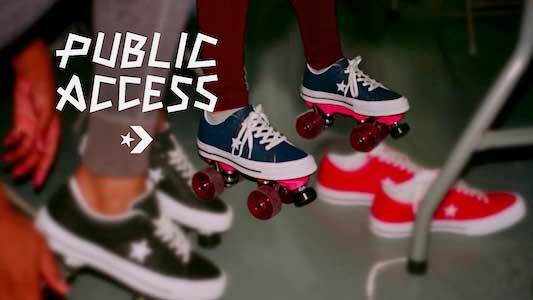 Converse has recently launched a new digital show called Converse Public Access. The show is a parody of the sometimes wacky and hilarious realm of local public access television. The show also aims to “present the voice and visions of today’s youth”. Each week, a new host comes on and interviews, plays games, and interacts with guests of their choosing. It’s an interesting concept, and you can easily tell the show is aimed at a younger demographic looking for irreverent humor. The first episode features Game Of Thrones actress Maisie Williams as host with guests Millie Bobby Brown, Flynn McGarry, Amandla Stenberg, and Syd. 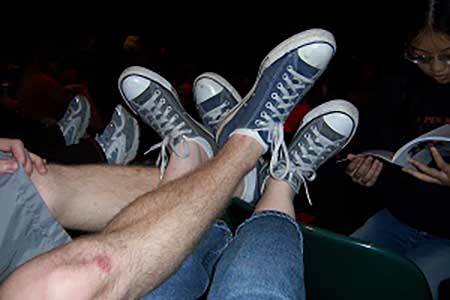 Each show also features all of the guests wearing some form of Converse shoe, with the first episode seeing them wear the Converse One Stars. Host Maisie Williams and her first guest Millie Bobby Brown. Your love of the show’s humor will vary based on your comedic tastes. The best comparison of this show is to the surreal comedy of The Eric Andre Show, as both shows parody the ridiculousness of low budget public access television. 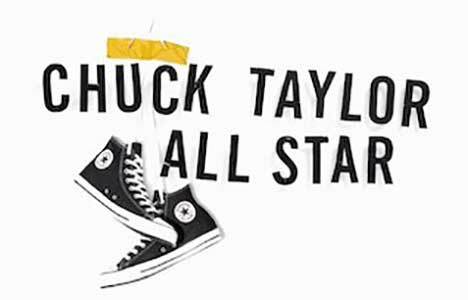 One negative of this first episode is that there wasn’t much love for the classic Chuck Taylors. All of the guests and Maisie were wearing the new line of Converse One Stars. One the one hand, it’s easy to see why Converse would make the One Star the focus of this show, since that shoe has been the focus of the brand for the majority of 2017. Hopefully future episodes and hosts rock the shoe that brought Converse to the dance, and highlight chucks in a new way. Overall, a great first episode that gives an interesting glimpse as to what this show will be, and leaves the audience looking forward to what the next host will bring to the table. 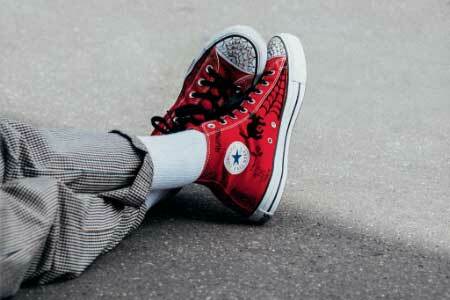 The first episode of Converse Public Access focuses on the Converse One Star. Rose and Sangria All Star ’70 low tops. When it comes to warm weather fashion for men, there isn’t much to talk about besides cargo shorts, tee shirts, and a pair of chucks. 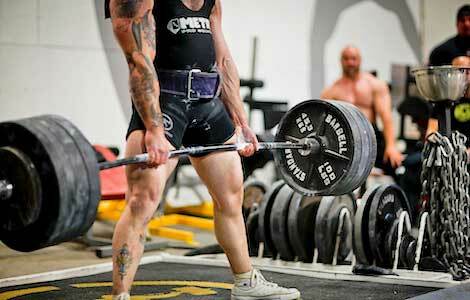 Regrdless of your footwear preferences, cargo shorts are the pants of choice these days for men. While some don’t consider them fashionable, cargo shorts are comfortable to wear and practical because you can carry everything you need in the variety of pockets. Cell phone, wallet, keys, glasses all have their place in a pair of cargo shorts so you are not stuck having to carry anything else and everything you need is right there with you.